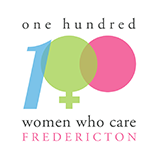 First meeting of 100WomenWhoCare-Fredericton of 2018 will be on Thursday March 22 @ 6pm! We welcome you to join us to hear three charities speak of the change they are making for our community and how we can help them. You decide whom is going to receive our money this evening. 100 Women X $100 = $10,000 for positive change!